Catholic News World : #BreakingNews 100,000 at #ProLife Rally in Ireland - Biggest Ever to Protect Life from Conception! #BreakingNews 100,000 at #ProLife Rally in Ireland - Biggest Ever to Protect Life from Conception! SAVE 8 Rally would like to thank the amazing work done by Youth Defence, Life Institute and Precious Life in mobilising the biggest rally ever seen on this issue. 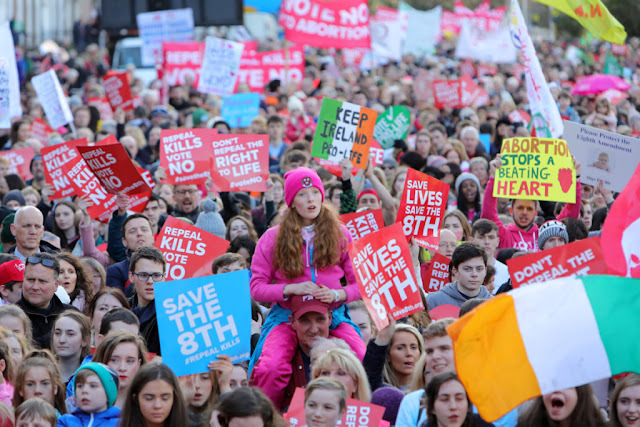 Save the 8th has said that its campaign is “energised and motivated ” by the huge attendance at today’s Rally for Life in Dublin, which saw up to 100,000 people take to the streets to reject the Government’s plan for a UK-style abortion regime in Ireland. Niamh Uí Bhriain of Save the 8th said that the crowds who thronged Dublin city centre showed that the government’s abortion proposal had woken a sleeping giant and that the campaign now expected a surge in volunteers to work towards a No vote in the abortion referendum in May. The rally heard from a range of speakers from diverse backgrounds, including doctors, mothers, people with disabilities, and political figures. Dr Judy Ceannt, a relative of 1916 leader Eamonn Ceannt, was amongst a host of speakers to address huge crowds in Merrion Square. Dr Ceannt, a GP, told the Rally that the government wants to repeal the 8th so that they can request that GPs provide abortion on demand for the first three months of an unborn baby’s life. “They have not even consulted us doctors. The basic law that governs our actions as doctors is first do no harm. We are not meant to intentionally kill or harm any patient, least of all the most helpless, the unborn baby. The government has no right to impose this on us,” Dr Ceannt said. Another doctor, Maire Neasta Nic Gearailt, showed the crowd with a €100 voucher for Specsavers, which she said would be sent to Senator Catherine Noone, after the Oireachtas Committee chairwoman said she “could not find” any doctors who favoured retaining the 8th amendment. Also speaking at the Rally was Charlie Fien, a Down syndrome activist who recently gave an impassioned plea to the United Nations in March 2017 where she spoke out against the targeted killing of children diagnosed with Down syndrome before birth.